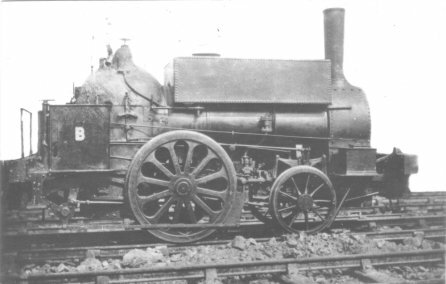 The second CHPR loco, 1835-1876. See X446 for detailed history. The CHPR was one of the earliest railways in Britain, opened in 1830. 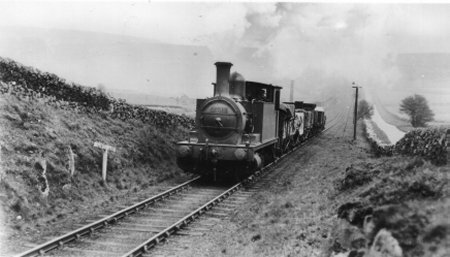 Running 33 miles from Cromford to Whaley Bridge, it climbed 1,000 feet then dropped 700 feet, with 9 steep inclines worked by stationary steam engines hauling cables. 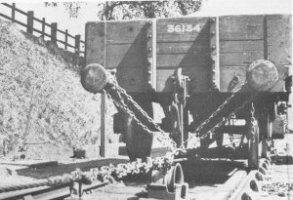 Wagons were attached to the cables by plaited chains. Flatter sections were worked by horse or gravity. The first 6 miles ran within the Wirksworth Area, and many men are found in the Census working for the CHPR. Description from the Railway magazine 1934. Description from "Discover Derbyshire" 1999. CHPR gradients, between High Peak Junction and Longcliffe. North face of Newhaven tunnel. 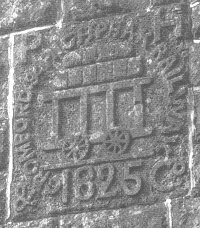 The inscribed stone shows the crest of C & HPR, a 4-wheeled wagon on a shield, with the motto "Davina Palladis Arte", the whole surrounded by a garter reading "Cromford & High Peak Railway Comp'y Incorporated 1825". Above is Jos.Jessop Esq. engineer and below W.Brittlebank Esq. Brittlebank & Son of Oddo House, Wirksworth, were Attorneys at Law to the company. 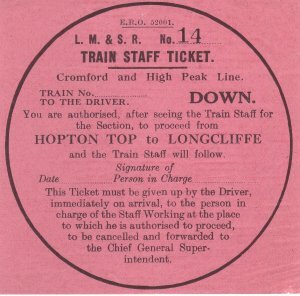 Staff Ticket for Hopton Top to Longcliffe section. A paper ticket was issued to a driver, who must have seen the single line staff, authorising him to proceed through the section. This is how consecutive moves could take place in the same direction under staff and ticket working. Staffs were Square/Circular/Triangular and assorted colours, dividing the line into 9 section. Staffs were suspended on the weather board of the engine. South face of Newhaven tunnel Another inscribed stone reads "Cromford and High Peak Railway", P.H. & Co, and 1825, and shows a wagon carrying stones. Middleton Top engine house (1829-1963), where a stationary engine drove cables which pulled balanced loaded and empty wagons up Middleton incline (1 in 8). Hopton incline, 1 in 14, once cable operated like Middleton incline, but later the steepest line in Britain regularly worked by an adhesion loco, pulling a maximum of 38 tons. for movement of the wire rope. 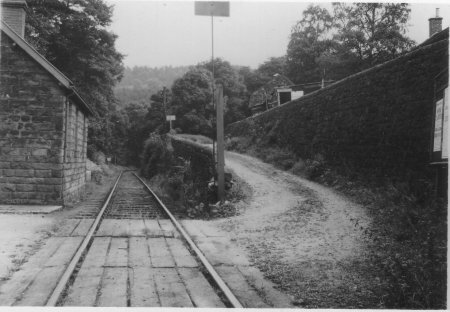 "Cromford and High Peak Junction"
Middleton Incline looking uphill from the foot of the incline, taken about 1958. Horizontal and vertical guides are used to steer the cable (which is under great tension) around the bend in the rail. 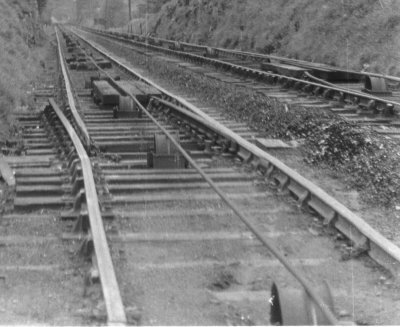 The buffer on the right is part of Middle Peak sidings. 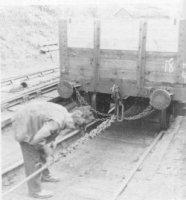 Steps in "hanging-on" or plaiting the chain around the cable which pulls the wagons up inclines of 1 in 8. The chain had progressively smaller links which had a tapering effect and so tightened under pressure. It was fastened off with leather belts, which had a tongue and buckle. Most accidents were caused by a belt breaking. One of the treadles depressed by the wheels of passing wagons descending Sheep Pasture Incline. 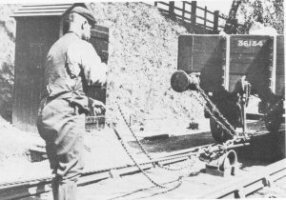 The treadles were connected by wires to gongs and the pointsman at the catch-pit was able to estimate the speed of descending traffic. Too fast and he let the wagons run straight on into the pit, instead of steering them round using the points. The most spectacular runaway occurred on 1 Mar 1888. At about 1900 hours, after dark, a wagon full of lime and a brake van loaded with 2cwt of gunpowder in boxes cased in iron were just beginning the descent when the connecting chain broke. As the vehicles shot forward the guard and a labourer jumped off the van and landed in deep snow, which probably saved their lives. At the bottom of the incline the vehicles had reached a speed calculated at about 120 mph. They leapt off the rails at the curve, flew straight over the canal, damaging its banks, and bounced over a stone wall. One of the canisters of gunpowder exploded and fragments of the vans were scattered around. In a third leap the remains of the vehicles crossed the Midland line, damaging the rails. Cromford Goods 1935. 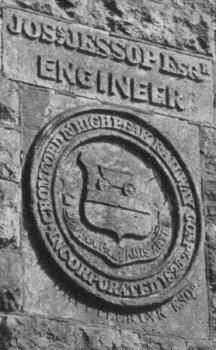 Still at that time working was the ancient banner type signal that protected the internal level crossing of the road that led to the A6 highway. Over the wall at the rear is observed part of the row of cottages known as High Peak Junction, thought to have been originally built by Sir Richard Arkwright for his workers and later acquired by the CHPR. Going too fast. 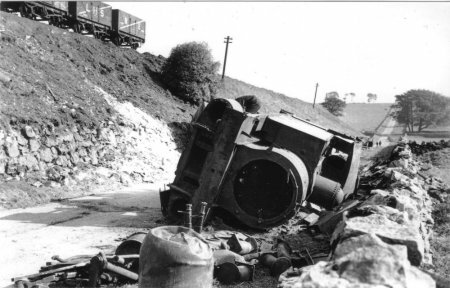 On Wednesday 6 Oct 1937 there was a derailment near the foot of the Hopton Incline. Ex NLR 0-6-0T number 27521, with four loaded wagons and a brake van, derailed at 45 mph on the curve while working up speed to climb the incline, killing the driver William Boden. Eight days after the accident, the remains of 27521 waiting to be hoisted up the embankment. (more...). The High Peak Railway starts its sinuous, mountainous and lonely career at High Peak junction, between Whatstandwell and Cromford stations on the Derby-Manchester main line of the L.M.S. Two exchange sidings are provided on the down side of the main line and from these the High Peak line turns off through the woods, on a rising gradient of 1 in 200, to Cromford Sidings, at the foot of Sheep Pasture incline, which is a mile distant from the junction. The first 500 yards are worked as a siding, after which a staff section extends to the foot of the incline. Just before reaching Cromford proper is a goods warehouse, close to which is a road crossing protected by an old hand-operated signal consisting of a rectangular oblong plate carried on a rotating post. This must be one of the oldest railway signals in the country. At the foot of Sheep Pasture incline and between the road and the Cromford Canal are, Cromford Sidings, the old High Peak workshops, (still used for light repairs), and a small shed housing the solitary locomotive employed between Cromford and High Peak junction; this is usually an ex-L.N.W.R. 0-4-2 pannier tank. Among the wagons in the sidings will be noted a number of old L.N.W.R. four- wheeled locomotive tenders; these have been. converted into tank-wagons for conveying fresh water from Cromford Canal to locomotive stand-pipes on the High Peak section, and also to the village of Longcliffe, which has no fresh-water supply other than this. Passing under the Derby-Matlock road, the line ascends the Sheep Pasture incline, which is cable-worked, ¾ mile long, rising at 1 in 9 for the first half-mile and at 1 in 8 for the remainder of its length. Originally it consisted of two inclines, Cromford and Sheep Pasture, which were amalgamated in 1855; the point of division is now marked by a short level stretch of fencing halfway up. There is believed to have been a winding-engine between the two inclines, but no trace of this now remains. The original winding engine at Sheep Pasture was replaced in !883. Immediately after passing under the road bridge previously referred to, the up and down tracks separate and pass on either side of a large catch-pit for runaway wagons. 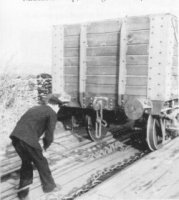 The points, on the descending line are normally set to direct wagons into the pit; they are worked from an adjacent cabin, and it is the pointsman's duty to set the road for the main line if and when. he is satisfied that descending wagons are fully under control. Automatic gongs, some distance apart, are rung by the wagons as they come down, affording to the pointsman an indication of the speed at which they are travelling. In addition to the protection afforded by this catch-pit, there are three pairs of catch-points on the ascending line and a trap-point at the summit on the descending road to derail any vehicles which might inadvertently start to move down the incline without being attached to the cable. The journey of the wagons up and down the incline is called a "run," which may be made either by balancing or by winding, the maximurn gross weight permitted for a "run" being 38 tons. Signals are provided at the top and bottom of the incline. and when the wagons are ready and attached to the cable, the pointsman at the bottom pulls off the signal at the top for the descending wagons; his colleague at the top then, but not before, pulls off that for the ascending wagons, and the "run" begins. From the incline, and again between the top and Middleton, magnificent views are to be seen, first of the Derwent Valley and Matlock, and then of the bleaker but ruggedly attractive Derbyshire hills. 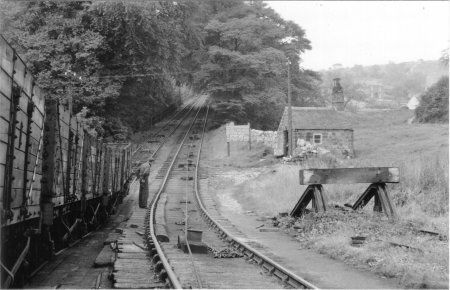 The last part of the incline is in cutting, with woods on either side; at the top are the winding house, sidings, and a shed for the engine - usually an ex-L.N.W.R. 2-4-0 tank - which on the one engine in steam principle operates the traffic over the 11 miles between the top of the Sheep Pasture incline, and the bottom of the Middleton Top incline. The intervening stretch of single track between the two inclines is sharply curved and has a number of siding connections, several of which lead to derelict quarries and are no longer in use. At Steeple house and Wirksworth Goods Depot, where there are three sidings, a short quarry line known as Killers Branch comes in. Between Steeplehouse and Middleton, the town of Wirksworth lies in the valley below and to the left, and considerable traces may be seen of the cable-worked incline which connected the High Peak line with the Wirksworth incline of the Midland Railway's branch from Duffield. A walled-off cutting marks the point of divergence from the High Peak line, and beyond this the old incline, which was double track, may be followed down to the site of its junction with the Midland line siding. On one side of the hill a quarry is rapidly cutting into the incline embankment, of which there are several relics at the bottom, including an overbridge, a derelict winding frame, and a pile of corroded cable. Actually, however, this incline was never brought into use. 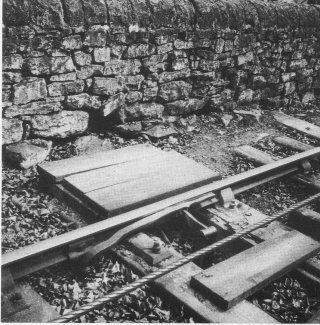 The Middleton incline, which is preceded by a series of sidings, is double track and cable-worked, 1,100 yd. long and on a gradient of 1 in 8¼; the principle of working is the same as at Sheep Pasture, with the exception that there is no catch-pit, and no signal at the foot, but catch-points are provided. No vehicles with less than 10 in. clearance above rail level are allowed to pass, over these inclines. 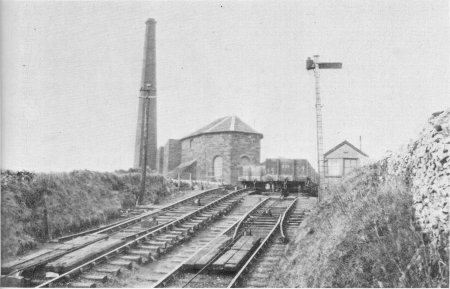 At the top of the incline are the engine shed and winding-house, the latter containing the original beam engine supplied by the Butterley Company when the line was opened. Its tall chimney forms a conspicuous landmark for miles round. The locomotive shed contains two engines for working the line between Middleton Top and Parsley Hay; for many years these were ex-L.N.W.R. 2-4-0 tanks, but in 1931 two very strange newcomers appeared in the shape of L.M.S. Nos. 7511 and 7521, 0-6-0 side-tanks of former North London design. There could surely be no more forceful comment on the freakish results of grouping than the presence among the bleak moorlands of the Peak of these two "Cockney" engines, which are admirably suited, how ever, to the duties of this peculiar line. From Middleton Top to Parsley Hay the line runs among bare and almost tree less hills, in marked contrast to the well wooded Derwent Valley; human habitations are few, and an occasional farmhouse or limestone quarry is the sole evidence of man's activities. This section is single track and worked with staff-and ticket, with staff stations at Hopton Top, Longcliffe, and Friden. 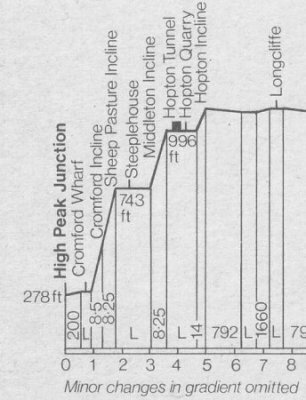 For the first 1¼ miles from Middleton Top to the foot of the Hopton incline there is a falling gradient of 1 in 1,056. Beyond Middleton Top a quarry is passed; a short cutting then precedes a tunnel, in which room was left by the engineers for double-track; beyond this a siding loop gives access to the. branch to Hopton Wood quarries, home of the famous Hopton stone. The tunnel was at one time much longer than it is to-day, but at some time unrecorded a section at the Cromford end was con verted to cutting. 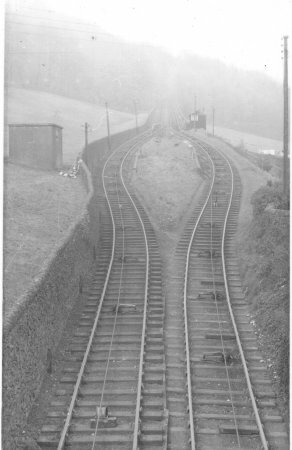 The line now curves sharply to the right and the Hopton incline comes in view; this incline includes the steepest gradient in Great Britain worked by adhesion only, by ordinary locomotives, and without any special form of assistance. Originally it consisted of 500 yards at 1 in 14, with a stretch of 1 in 470 at the top, but the 1 in 14 portion has been eased so that now only 50 or 60 yards are at this inclination, which is encountered almost at the top, and is preceded successively by 1 in 60, 30 and 20. The method of easing the grade was to lengthen the approach to the incline by building up the approach embankment. When first opened the incline was double track, but is now single, being worked on the staff-and-ticket system, while the original second track is in use at the top as a siding. At the foot of the incline is another siding serving a now derelict manure works. The ascent of the incline is made by "rushing" it down the slightly favourable grade from Middleton; the L.N.W.R. 2-4-0 tank engines can take up five empty or three loaded wagons at a time and the North London tanks, with their greater adhesive power, seven empty or five loaded wagons. There is no restriction on the length of descending trains, provided all brakes are pinned down before starting the descent. Hopton Top goods depot stands, as its name implies, at the top of the incline, and is five miles from High Peak junction. The worst gradients have now been surmounted and between Hopton Top and Longeliffe, the next staff station, the line falls at 1 in 792 for two miles past Harborough Brickworks, Manystones and Hickmans Limestone sidings. Longeliffe, seven miles from High Peak junction, is a relatively important goods depot, with siding connnections to limestone works and a fowl-grit factory. At Longcliffe a locomotive watering depot is provided by tender-tanks standing on a raised staging. Longcliffe is the starting-point of a daily milk train (Sundays included) to Manchester, which is the only Sunday train on the line. The Cromford and High Peak Railway (CHPR) was completed in 1831, to carry minerals and goods between the Cromford Canal at Cromford Wharf and the Peak Forest Canal at Whaley Bridge. Originally a canal was proposed for the route, but the number and steepness of the hills made this impractical. The railway was powered by horses on the flat sections and stationary steam engines on the nine inclined planes, and it took around two days to complete the 33 mile journey. Authorised by Parliament in 1825, its engineer William Jessop's son, Josias estimated a cost of £164,000, which proved to be a serious underestimate. Its function was to provide a shorter route for Derbyshire coal than the Trent and Mersey Canal, but it figured largely in early East Midlands railway schemes because it was seen as offering a path into Manchester for proposed lines from London. In 1833 steam locomotives were introduced on all but the very steepest of sections, but horses were still used for another 30 years. A passenger service was operated on the line between 1874 and 1877 with one through train in each direction per day. The continuation of the line from Buxton to Whaley Bridge via the Goyt Valley was largely abandoned in the late 1800's, though the track bed is still visible in many places. Traffic - mainly from local quarries - was slowly decreasing during the Beeching era, the first section of the line being closed in 1963. This was the rope worked 1 in 8 Middleton Incline. 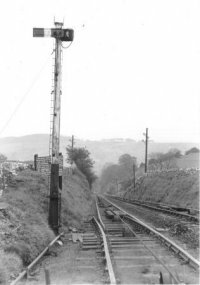 The rest of the line was fully closed in spring 1967, including the 1 in 8 Sheep Pasture Incline and the Hopton Incline, which, with a short stretch at 1 in 14, was the steepest adhesion-hauled stretch of railway in the UK. In 1971 the Peak Park Planning Board and Derbyshire County Council bought the track bed and turned it into the High Peak Trail - popular with walkers, cyclists and horse riders. The Middleton Incline Engine House has also been preserved, and the ancient engine once used to haul loaded wagons up is often demonstrated. Another attraction along the route is the Steeple Grange Light Railway, a narrow gauge railway running along the track bed of a branch line off the C&HPR. Near Cromford, the railway passed under Black Rocks a popular gritstone climbing ground, and gave the name to the 'railway slab', a short tricky 'boulder problem' by the railway track. "Discover Derbyshire - Wirksworth and the surrounding area"
This booklet also contains details of 6 walks in the area and makes excellent reading. The construction of the Cromford and High Peak Railway was considered to be an engineering masterpiece which later attracted railway enthusiasts, not only from this country, but from all over the world. It linked High Peak Junction at 277 feet above sea-level with Whaley Bridge at 517 feet. In the middle it rose to over 1,000 feet at Ladmanlow. Stretching for 33 miles in length, the line was fully opened in 1831, when it was used to transport minerals, corn, coal and other commodities from one canal to the other. When seeking to describe the railways bold and ingenious design, one nineteenth Century writer wrote: "The skyscraping High Peak Railway with its corkscrew curves that seem to have been laid out by a mad Archimedes endeavouring to square the circle". It had been the original intention to construct a canal to connect William JESSOP's Cromford Canal with Benjamin OUTRAM's Peak Forest Canal, but difficulties in ensuring an adequate water supply on the moors led to the scheme being dropped. Proposals were then put forward and accepted to build a railway. This involved steep inclines, up and down which wagons were hauled on chains until the 1850s and then on cables by steam driven winding engines. Initially, horses were relied on to pull the trucks along the flatter part of the route, but steam began to replace them in 1833 when the first locomotive came on the scene. The line continued to play an integral part in linking the canal systems for a further 20 years, when it was connected to the rapidly expanding railway network, which apart from providing a local service was also used to send limestone all over the country. Some passengers were carried in the mid 1800s in addition to the cargo, but their journeys were far from luxurious as they had to get off and walk when the train came to an incline. There were also frequent delays waiting for trains to link up, and the railway staff seemed to find it very "thirsty work", requiring visits to nearby public houses leaving the passengers no alternative but to await their return, or to join them at the bar, before continuing their journeys. In 1872, the passenger service was terminated because of lack of trade. Several accidents have been recorded on the line. At Sheep Pasture Incline, to the east of Middleton Top, a "catch pit "was dug after a spectacular accident when two wagons ran away, hurtling downhill, before leaping from the track at the bottom, over both the canal and railway line and finally coming to rest in a field completely wrecked. The "catch pit" is still there plus some interesting railway buildings at High Peak Junction. 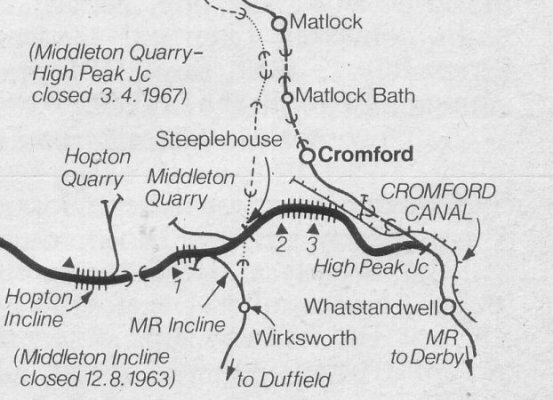 The closure of quarries and increased competition from road transport led to the Cromford and High Peak Railway finally closing down in 1967. Middleton Top Engine House still remains and is the sole surviving engine house of those that once stood at the top of every incline. It has been designated as an Ancient Monument, together with the Butterley beam-engine which used to wind the haulage cables. The engine has been lovingly restored and can be inspected by the public and seen in motion on the first weekend of each summer month and on Bank Holidays. The visitor centre tells the story of the CHPR and provides information, maps, walk leaflets, books, gifts and refreshments. There is a car park, toilets, cycle hire centre, engine house and picnic site. Following the closure of the Cromford and High Peak Railway, the land was purchased jointly by Derbyshire County Council and the Peak park Planning Board and in partnership with the Countryside Commission converted into the High Peak Trail. It stretches from High Peak Junction on the Cromford Canal to Dowlow near Buxton, a total distance of seventeen and a half miles. Surrounded by beautiful countryside the traffic-free trail is ideal for horse riders, cyclists, naturalists, and walkers. It is suitable for wheelchairs and pushchairs along the flat stretches. There is an abundance of wild life along the route and it is particularly noted for wild flowers including cowslips, wild strawberry and thyme. All the picnic sites car parks and information centres have been designed to provide visitors with the opportunity to relax and enjoy the magnificent scenery of the Derbyshire countryside. At Parsley hay the trail connects with the Tissington trail, which leads off in a south-easterly direction towards Ashbourne. The trail is managed by Rangers who apart from ensuring due care is taken of the countryside are always happy to provide helpful advice to make visits more enjoyable. Men found in the Census who declared they worked at a stationary engine. since there were stationary engines at paper mills and quarries. Click on the names to see all details of them and their families.